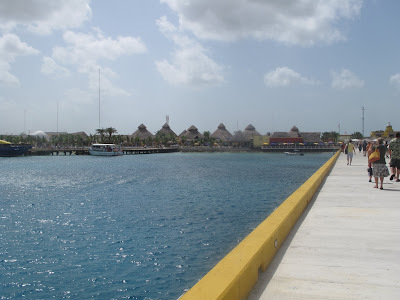 Our second and final stop was in Cozumel, Mexico. Once again, beautiful waters and beaches everywhere you turn. 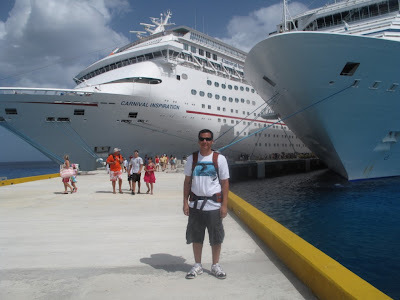 Here is a cool shot of Joey in front of our ship(alongside another ship) once we docked. 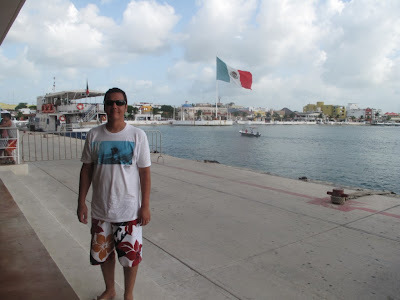 Here is the only picture taken in Cozumel, right when we got off the ship. 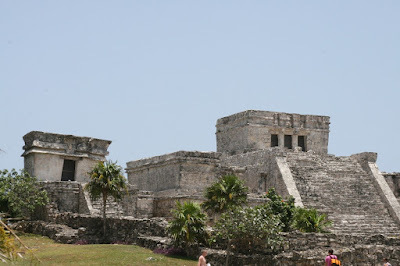 We decided to take a tour of the ancient Mayan city of Tulum while visiting this area of Mexico. A friend of ours recommended taking a tour with a man named Helaman Petlacalco. 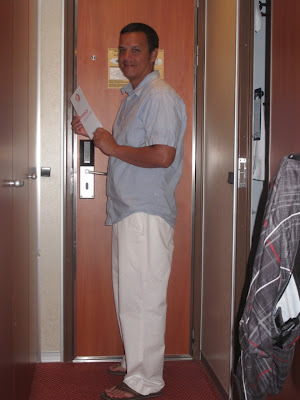 He is an LDS tour guide of Mayan and Aztec decent, who has been a tour guide for about 28 years. He has an in depth knowledge of the Mayan people, language, symbols, etc. If you are LDS and plan on visiting this area soon, DEFINITELY look into his tours. 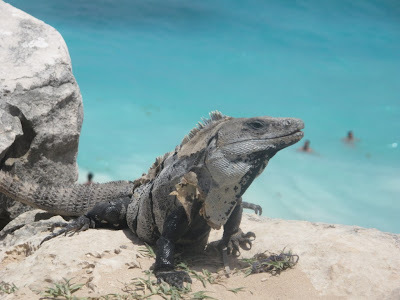 I believe he does Chichen Itza, Coba, Tulum and Ek Balam as well(and I'm sure he does more). It is a tour completely different than what you would get from anyone else in the area. The Book of Mormon perspective while viewing these ruins was incredible. I learned a ton. His company/website is called Helaman Tours. (click to get to his website and check it out!) He was awesome! 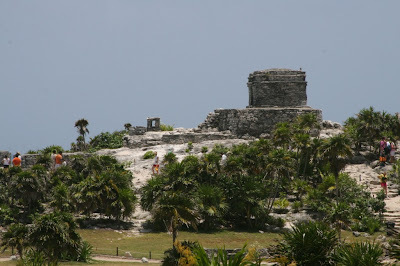 I would HIGHLY recommend taking a tour to any of the Mayan ruins in the Cancun/Cozumel area with Helaman Tours. 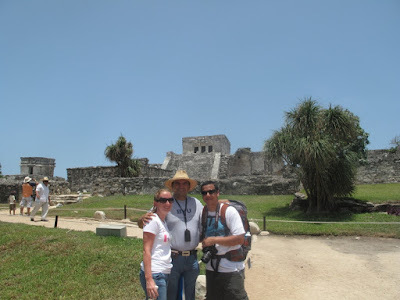 Here we are with our new friend Helaman in front of the main temple at Tulum. He said that other tour guides will call it a castle, but from what we know scripturally, this was in fact a temple. 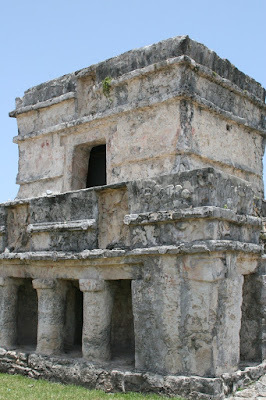 It was built very much like the description of Solomon's temple in the Bible. There was an outer wall and inner wall and areas set aside for worship. Very interesting. Totally awesome. If I remember correctly, these buildings are believed to have been built around 1200 AD. I don't know if you can see this well or not, but there were engravings and handprints on the interior of this building. So weird to see the handprints and think that someone was there and left those prints about 800 years ago. 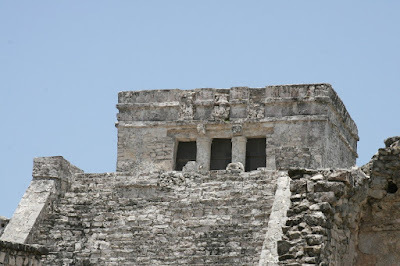 Above each door on this temple, are Mayan depictions of the Godhead. The really interesting one, to me, is on the far right-the rocks are just crumbled and the space is empty(which symbolized, to them, the Holy Spirit). 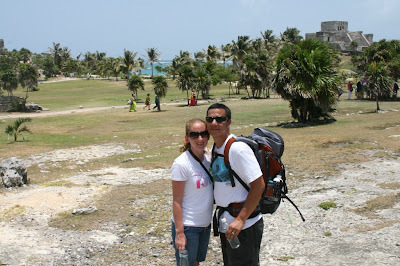 Joey and I with Tulum behind us. As you can see, there is a beautiful blue ocean behind everything. That is what saved us from the heat-the breeze from the ocean. It was a hot day but with the breeze it wasn't too bad at all. Another really amazing thing about this ancient city is that it was a living calendar. 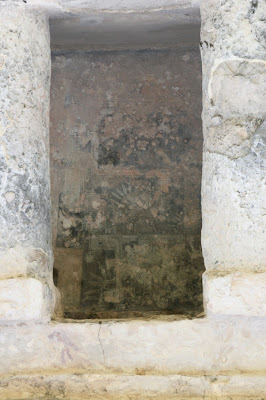 In this picture you can see a small doorway looking structure, almost like a rectangular frame. Well, 5 times a year, the sun will shine through that exact spot. The 5 times a year are, the day and exact time of each season change and then one of their ceremonial days. The beach was wow. I'd never been to a beach that looked anything like this. Heaven! 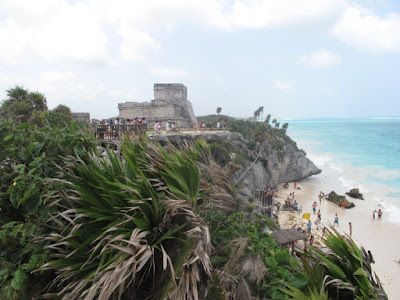 This city was built on a cliff overlooking the ocean. So cool. 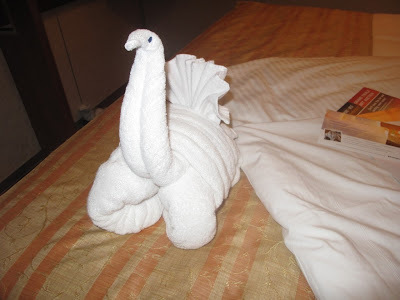 And the towel animal for the night was. . . 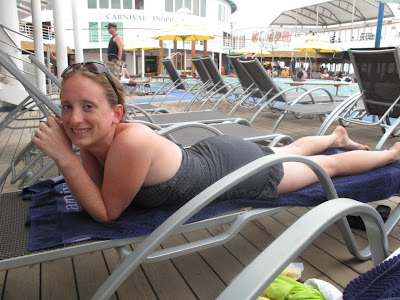 Here I am the next day sportin my new Grand Cayman dress/swimsuit coverup. 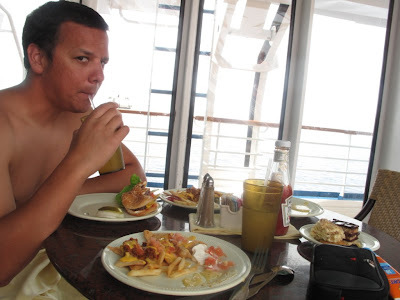 We spent the last day just chillin on the ship. More pool time, water sliding, reading, karaoke, shows, music, etc. 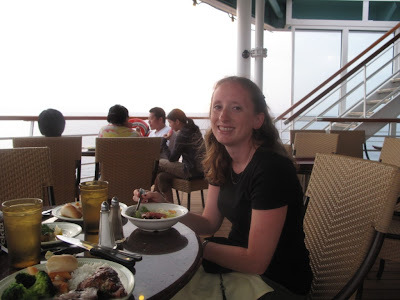 And this is where we spent lots of time. . .eating on the lido deck. Relaxing. 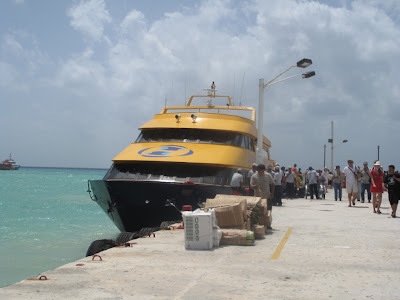 Ahhh, to be back on that ship. . .
Our last dinner we decided to eat on the deck at sunset. I was so glad we did. It was beautiful. And the main restaurant was ticking us off(we were wait listed or as they call it put on the "Your Time" dining list-ugggh. It sounded great, but it was awful. They make it sound like you can come eat whenever you want and with whoever you want instead of the usual scheduled early or late dining seating. Well, you have to wait. Every night. We had to wait 30 minutes at least to be seated each night. And our waiters were terrible and ignored us! I don't recommend the Carnival "Your Time" experience. Because it wasn't our time, it was theirs. It was when they could squeeze you in. Anyways, that was our main complaint of this Carnival Cruise trip, other than the tacky Carnival casino-like decor:) Otherwise, everything was great. I have no other complaints for them(which is good for me!) We had a wonderful wonderful time. 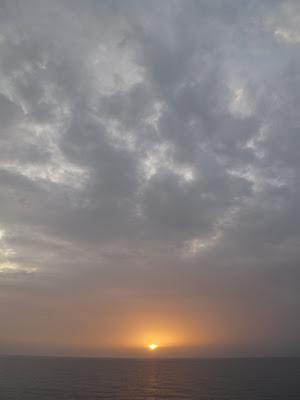 Joey took this picture of the sun setting that last night. 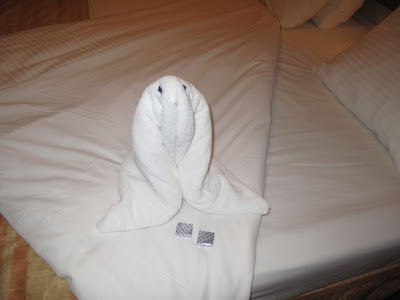 . .
And say hello to our last towel friend. A walrus? I'll leave you with one more picture. The machine we wanted to take home with us. . .
24 hour icecream and pizza was definitely heaven! We were very sad when we disembarked the last day:( What a wonderful vacation! But we were also anxious to see our girls. A total of 6 days away felt like forever! Holding them in our arms again was better than any vacation. I'm so glad Joey and I were able to take a trip together, just the two of us. I think we deserved it! I think all couples, especially you guys out there with kids, need to go on an adult vacation every now and then. It definitely helps keep you young and helps keep the romance alive in the relationship. Joey, you are my my love, best friend, my everything. I had a blast with you! And I also know our kids had a blast while we were gone because they were at two of their most favorite places in the world-their grandparents homes! A special thank you to my parents and Joey's parents for taking such good care of our kids while we were gone. We couldn't have done this without you. We love you so much! Thanks for the sweet words. It was one of the best vacations. P.S. THANK YOU everyone for helping out with the kids! Looks like y'all had an awesome time. It brings back memories from mine and Orlando's cruise. I so want to take another one. 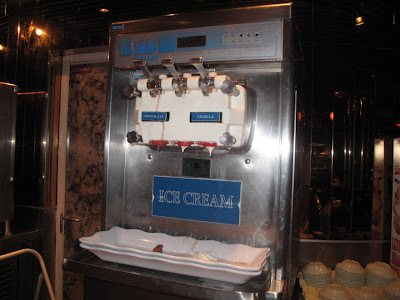 I too wanted to take the icecream machine home, lol. Looks like you guys had a fun cruise! Glad you guys had a wonderful time. 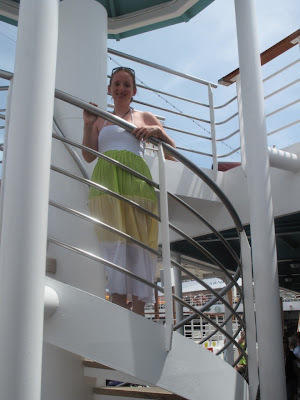 OH my word, I have been MIA on your blog for too long, I didn't even know you went on a cruise! bad me, it won't happen again! and you go girl, with those stingrays, I am deathly afraid of the ocean, too big, too blue, and too scary! You rock girlfriend! hugs to you again! Looks like you had a blast!!!!! And well deserved for you both Congrats again! !We hope to take one for our 10 year anniversary. I hope I hope!!! When we went there we found the ruins so humbling. 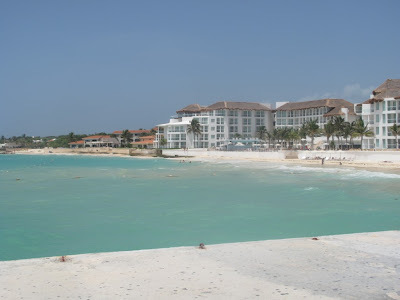 I love that place and the beaches are beautiful. I am so glad that you guys had such a great trip. What a great trip. 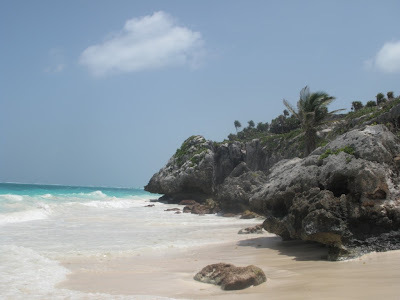 I love Tulum too....and Helaman was also our guide when we were there.He was great. Like you I would definately pick him again. Sorry about the dinner wait problems. I have not heard of that option but I will tell my clients not to choose it. looks like ya'll had so much fun. i'm glad that ya'll were able to relax and have some time alone. ya'll deserved it. I really just have one word: Wow! The ruins (and the beach next to them) are awesome. If I went on a cruise, that is definitely where I'd want to go. Ahhh, this makes me want to set sail right now! The beach looks amazing, those dragons looked scary, and the food sounds delicous! Love the picture of Joey and the "privacy please" sign, lol. ;) Glad you guys decided to come back. OOOOHHHH!! 24 hour ice cream?! Score!! Beautiful pictures Holly! What fun! We have always wanted to do one of those BoM trips, so I am glad that y'all enjoyed it Good times Holly!